"Nonviolence is an active force of the highest order. It is soul force or the power of Godhead within us. Imperfect man cannot grasp the whole of that essence - he would not be able to bear its full blaze, but even an infinitesimal fraction of it, when it becomes active within us, can work wonders." Gandhism, a fusion of Gandhi's views and ideologies, is based on the concept of ahimsa or non-violence. Mahatma Gandhi led and won a war based on a simple yet effective and strong principle of non violence. In his fight against the British during the Independence movement Mahatma Gandhi organized various movements but all were based on the Gandhian Principle of non violence. Ahimsa is derived from the Sanskrit language. The verb root san means to kill. Hims means "desirous to kill" and the prefix a- is a negation. So a-himsa means "No desire to kill or harm". Ahimsa in itself is a very strong word and when implied in the principles of life one can control his actions and develop patience and strong will power. Also ahimsa leads to results that bewilder the world with its strength. It is a strong effective weapon against the evil. The concept of ahimsa extends to all and therefore, protection of environment and natural habits are its natural derivatives. Buddhism and Jainism also practice the concept of total non-violence. In Hinduism, it implies to the principle of non-violence to living beings. Mahatma Gandhi formulated the ideology of Satyagraha which means non violent resistance or civil resistance. He followed Satyagraha in his independence struggle in India and also during his time in South Africa where he fought against racism. Satyagraha is derived from a Sanskrit word satya meaning "truth" and graha meaning "insistence" or "holding firmly to" therefore it means holding onto truth or truth force. The non cooperation movement and all the other independence movements were formed on the principle of Ahimsa or Satyagraha by Mahatma Gandhi. She was simple and calm. But in her calmness was the real strength that motivated Gandhi. Over the years she kept pace with her husband and was a pillar of strength for him. She supported him in his pursuit for social, economic and political equality for Indians in India and prior to that in South Africa. She was amongst the first of the Satyagrahis, or non-violent resisters, to protest against the decision of the South African government to declare all non- Christian marriages null and void. Kasturba bai became a political actor to support her husband in his political ideas after Gandhi and Kasturba permanently returned to India in 1917. Her commitment towards the freedom struggle was just to support her husband but it was her love for the nation that made her an inspiration for the whole world including Gandhi. Gandhi in his book “My Experiments with Truth” wrote that Kasturba was not in any way less than him. “If anything she stood above me. But for her unfailing co-operation I might have been in the abyss… She helped me to keep wide awake and true to my vows. She stood by me in all my political fights and never hesitated to take the plunge. In the current sense of the word, she was uneducated; but to my mind she was a model of true education. She was a devoted Vaishnav. But she had obliterated all feeling of caste from her mind and regarded a Harijan girl with no less affection than her own children. She personified the Kasturba Gandhi ideal of which Narsimha Mehta has sung in Vaishnavajana hymn. There were occasions when I was engaged in a grim wrestle with death. During my Aga Khan Palace fast, I literally came out of the death’s jaws. But she shed not a tear, never lost hope or courage but prayed to God with all her soul”. Kasturba Gandhi took over the roles of her husband when he was imprisoned. During the Quit India movement Gandhi was imprisoned before he could address a public meeting in Shivaji Park near Bombay. He wanted Kasturba to take his place. She readily agreed to go on with the duties her husband had bestowed on him. Around 1 Lakh people went wild with enthusiasm when they saw her but she was taken a prisoner and sent to the Arthur Road Prison in Bombay. The prison she was put in was filthy and she fell ill. After a few days she was transferred to Aga Khan Palace in Poona where Gandhi was detained. This was to be her last prison sentence. She died during her days in the prison. Till her last breath she was an inspiration to the nation and her husband. Shrimad Rajchandra, a valued philosopher, writer and poet, was the spiritual guru of Mahatma Gandhi who inculcated the qualities of satya and ahimsa in him. They met in Mumbai in 1891 and were in constant touch with each other through letters while Gandhi was in South Africa. Gandhi mentioned the noted his impression of Shrimad Rajchandra in his autobiography, The Story of My Experiments with Truth. In the book he mentioned Rajchandbhai as his "guide and helper" and his "refuge in moments of spiritual crisis". Shrimad Rajchandra counseled Gandhi to be patient and to study Hinduism deeply. 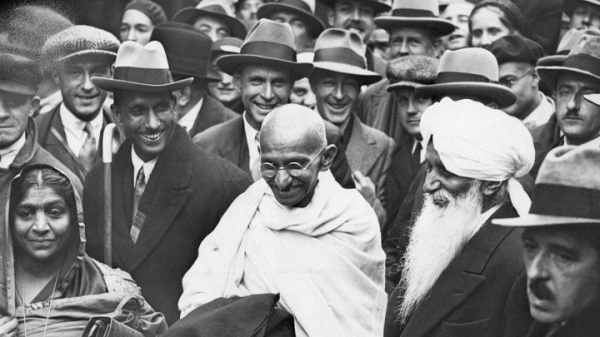 His teachings directly influenced Gandhi and motivated him to follow the principles of non-violence.